Some novels are so full of eccentric food and cooking instructions that it seems the best treatment of them would be to write a second book trying all the recipes. The Sea, the Sea, by the British novelist and philosopher Iris Murdoch (1919–99), is one such novel. In its first pages, Charles Arrowby, a retired actor and theater director, veers from his description of the English coast, where he’s come to work on his memoirs, to discuss his lunch. I’m reproducing the following passage in full, since it’s exemplary of the book’s treatment of food. It is after lunch and I shall now describe the house. For lunch, I may say, I ate and greatly enjoyed the following: anchovy paste on hot buttered toast, then baked beans and kidney beans with chopped celery, tomatoes, lemon juice and olive oil. (Really good olive oil is essential, the kind with a taste, I have brought a supply from London.) Green peppers would have been a happy addition only the village shop (about two miles pleasant walk) could not provide them … Then bananas and cream with white sugar. (Bananas should be cut, never mashed, and the cream should be thin.) Then hard water-biscuits with New Zealand butter and Wensleydale cheese. Of course I never touch foreign cheeses. Our cheeses are the best in the world. With this feast I drank most of a bottle of Muscadet out of my modest ‘cellar’. I ate and drank slowly as one should (cook fast, eat slowly) and without distractions such as (thank heavens) conversation or reading. Indeed eating is so pleasant one should even try to suppress thought. Charles’s food descriptions are wonderful in their particularity and spur all kinds of culinary thoughts, such as, Can canned baked beans be redeemed by good olive oil?, and, Why hasn’t the old-fashioned dessert of fruit in heavy cream made a comeback? The preparation details are a boon for a person wishing to replicate the food. 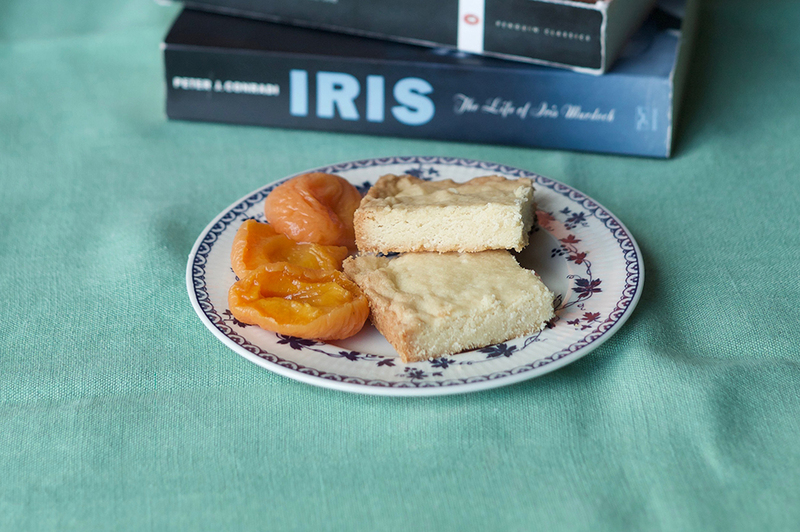 Another simple dessert of apricots with shortbread cookies specifies that the apricots, if not available fresh, should be obtained dried, and soaked for twenty-four hours. 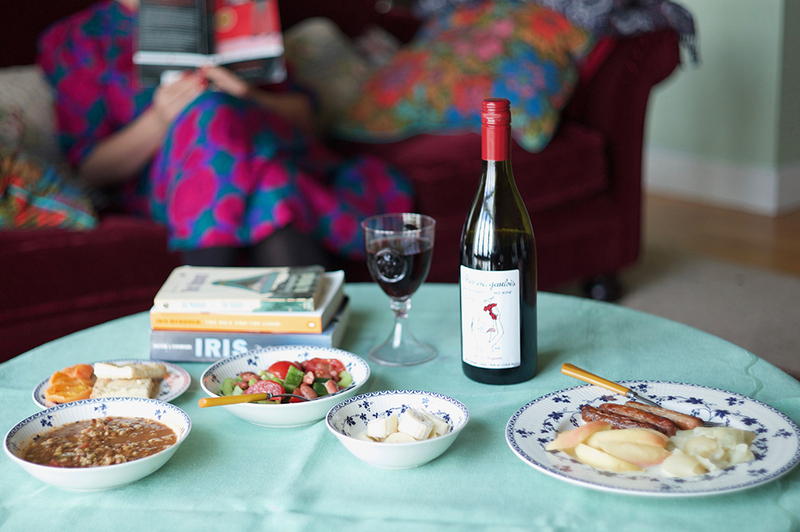 Each meal comes with a wine pairing. 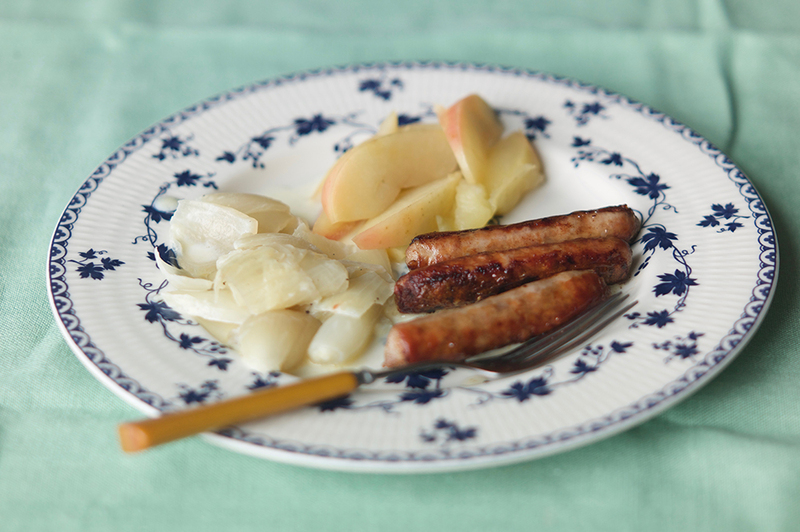 Small sausages of good quality cook fast, require no prep, and elevate even boiled onions and stewed apples—Murdoch’s recommended sides. 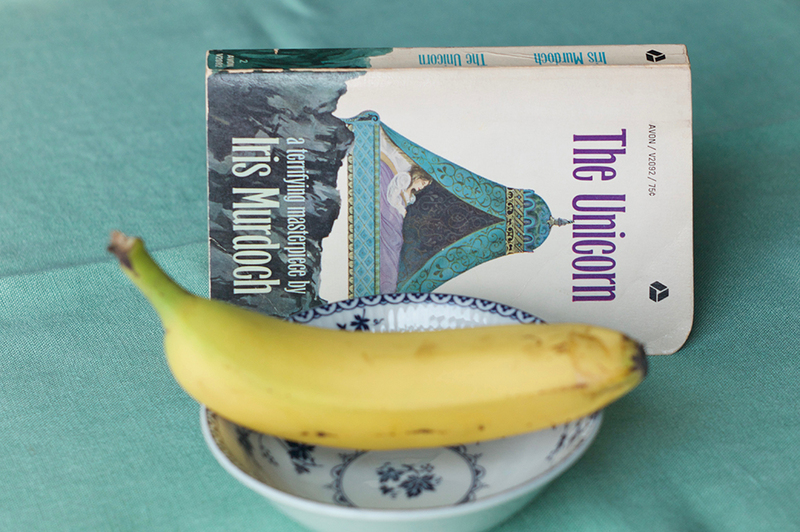 I could use some of this philosophy in my life—as I am one of those “unfortunate women” who do nothing but cook!—so I set out to test Charles’s recipes, despite knowing that he’s an unreliable narrator and that Iris Murdoch was not a foodie. Far from being an embrace of the culinary, the passage above is the first sign that maybe things with Charles are not as they seem. His fastidious and opinionated tone and self-gratifying habits are at odds with his stated intention to retire to the seashore and conduct his “recollection[s] in tranquillity” and possibly even to “repent of a life of egoism.” The cautious reader will note that it takes ego to elevate one country’s cheeses over others’, or to presume to tell all human beings not to mash their bananas. We also notice that a person with a wine cellar (even a wine cellar in quotations) who brings his own supply of olive oil from London is likely lying when he tells us he’s ready to renounce the world. Charles’s self-deception about his intentions is a forerunner for other delusions. The majority of the book’s action concerns his discovery that an ex-girlfriend named Mary Hartley Smith coincidentally lives nearby. Hartley is now a “stout elderly woman in a shapeless brown tentlike dress,” but Charles suddenly imagines her as the love of his life, discarding a love mentioned in earlier pages—whom Charles’s memoirs were supposed to be about—and reinterpreting everything in the light of having lost this unlikely partner. (Readers who recall the early days of Facebook, when it seemed everyone was discovering exes they’d actually never stopped loving, may recognize this disease.) He pursues Hartley to cruel and insane lengths, never recognizing his own egoism, jealousy, and vanity. Mistaking egoism for love is the true topic of the book—and one of Murdoch’s perennial subjects. “She thought the temptations of vanity and power in matters of love both difficult—and important—to avoid,” her biographer Peter J. Conradi writes in Iris: The Life of Iris Murdoch. Her philosophical works, Conradi writes, like Simone Weil’s, gave “to love-experience a central place in ethics, yielding a whole metaphysic … The force that imprisons is low Eros—base, blind, obsessive desire; the force that releases is high Eros—sublimated love, love of what is highest, desire educated and transformed, refined and dispassionate.” Charles’s love for Hartley is an expression of “low Eros,” and the sea of the book’s title is an allegory for his ego, with its changing moods and vast, sweeping (oceanic, in fact) power. The sea is Charles’s element—“I am a skillful and fearless swimmer,” he says—but in the end, he nearly drowns and is saved via a religious mystery, which he’s only temporarily able to grasp. 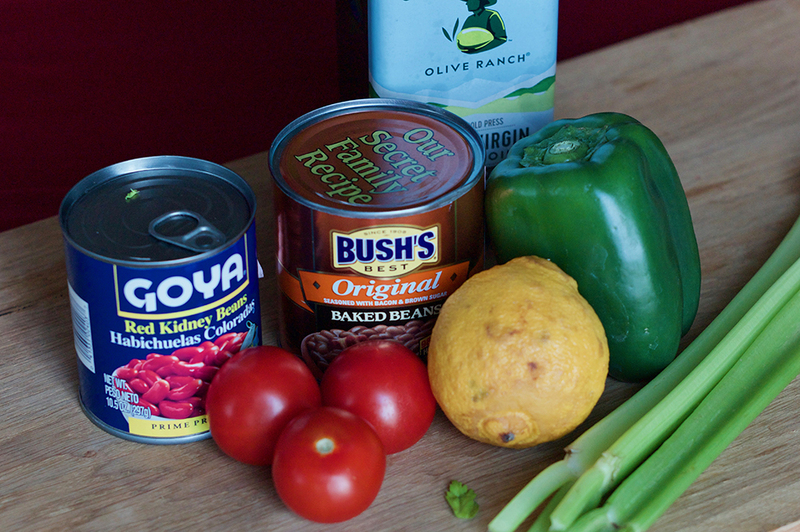 The ingredients for a two-bean salad that can be assembled in four minutes. Murdoch believed in the untidy nature of truth (a problem with works of art, to her mind, was that they tended to package things too neatly), and one of the book’s contradictions is that although Charles is terrible, he’s charming, too. Another, at least for my purposes, is that while Murdoch is using Charles’s epicurean streak to echo his other solipsisms, the way he cooks is lifted from her own happy domestic life, in which her husband, John Bayley, assembled meals from cans while Murdoch wrote. The couple lived in an eccentric English country house outside Oxford, and the disorder of their housekeeping was legendary. They had, Conradi says, an “aristocratic disdain” for food, but they were avid hosts and enjoyers of life. When a contemporary called the recipes from The Sea, the Sea disgusting, Murdoch replied, “But this is what John and I eat all the time.” I had to try. 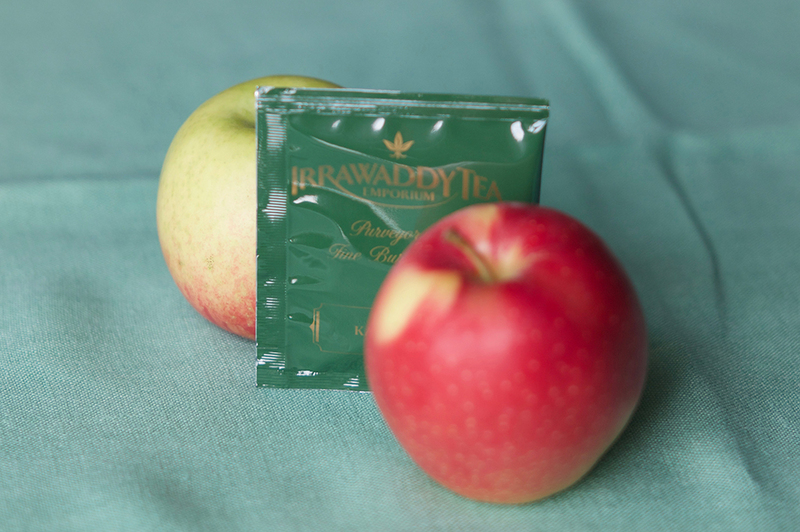 I stewed my apples in a Burmese green tea that tastes like sticky rice, which transmitted a faint but pleasant flavor. The “light Beaujolais” had to satisfy Charles’s criterion that the wine not be fancy. I chose Marcel Lapierre’s Raisins Gaulois, sold for sixteen dollars a bottle at Astor Wines and Spirits. This wine is classified as a “vin de France,” a designation for basic table wine in France. More expensive bottles tend to be more specific about where the grapes are from. I slightly cheated on quality because the wine comes from the cult importer Kermit Lynch, which boded well despite the vin de France designation. 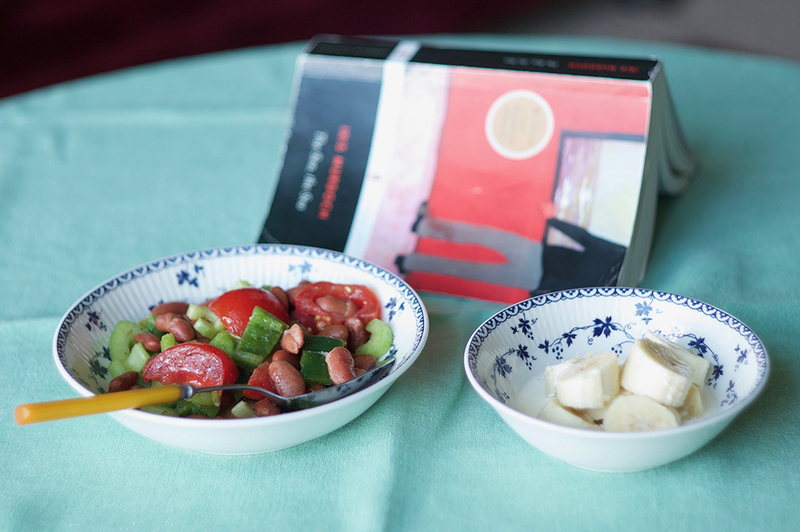 Since all this cooking was fast and easy, I also had time to make two more dishes and answer my own questions from earlier regarding the canned bean salad—i.e., would that be as gross as it sounded?—and the bananas-in-cream dessert. The results were … interesting. Eating the full meal sequentially, with the wine, was delicious. The components were simple, but lentil soup and sausage and shortbread with apricots are all bright, yummy foods, and the concept of many easy courses felt like a daily decadence I’d like to have more of. I didn’t think that tea-stewing did much for the apples, nor is boiling the best way to cook an onion, even if you do drown it in milk and slather it in butter afterward, but the flavors weren’t bad. With the good sausage, the sweet, bland accompaniments had a childhood-comfort feeling. 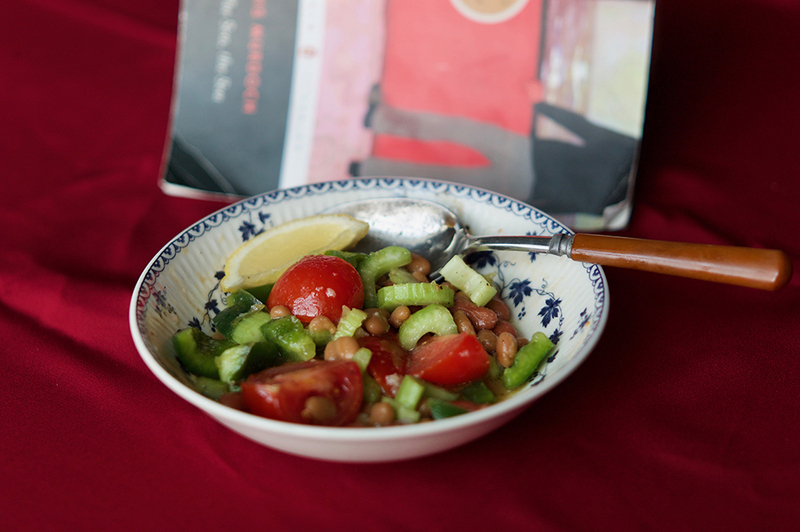 The bean salad was similar—it reminded me of something my mother used to bring tubs of to me at college—but only until I added the baked beans, at which point I changed its rating to inedible. I could possibly like canned baked beans hot, but not cold and mixed with other elements. 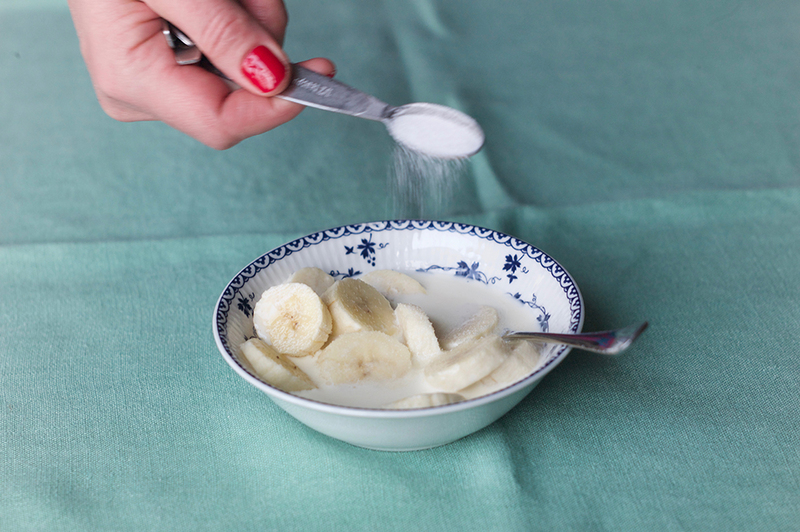 And the banana in sugar and cream was like baby food. If Murdoch really ate this way—and I’m convinced she did and that Charles’s recipes were taken directly from life, since I timed it and the bean salad took me precisely four minutes and four seconds to put together—perhaps it was a way of rising above the selfish demands of the ego and achieving a more transcendent love. Cook the bacon in a large, heavy-bottomed soup pot over medium-high heat, until crispy. Remove, crumble, and reserve. Discard all but two tablespoons of the bacon grease, and return the pot to heat. Add the garlic and celery, and sauté, two minutes, enough to remove the raw edge of the garlic but not enough that it begins to color. Add the salt and Aleppo pepper, and stir. 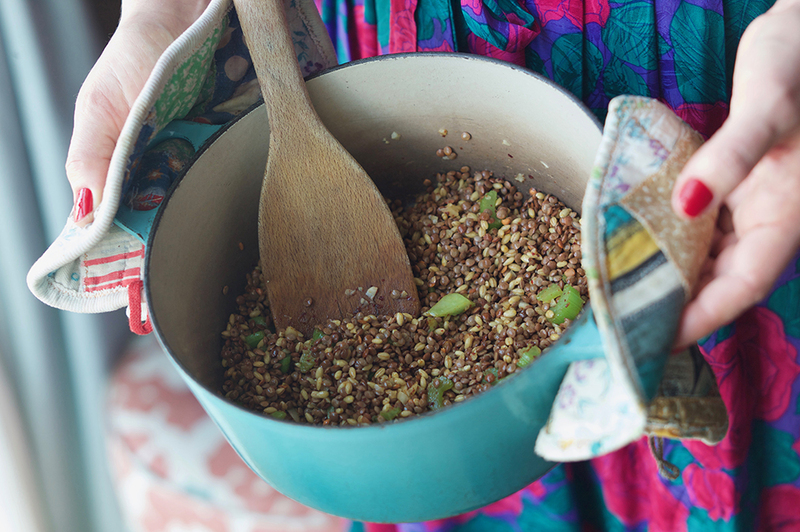 Add the lentils and barley, and stir to coat, tossing and frying for two minutes to combine. Add the tomatoes in their liquid, the chicken stock, and the dried mint. Cover, and bring to a boil. 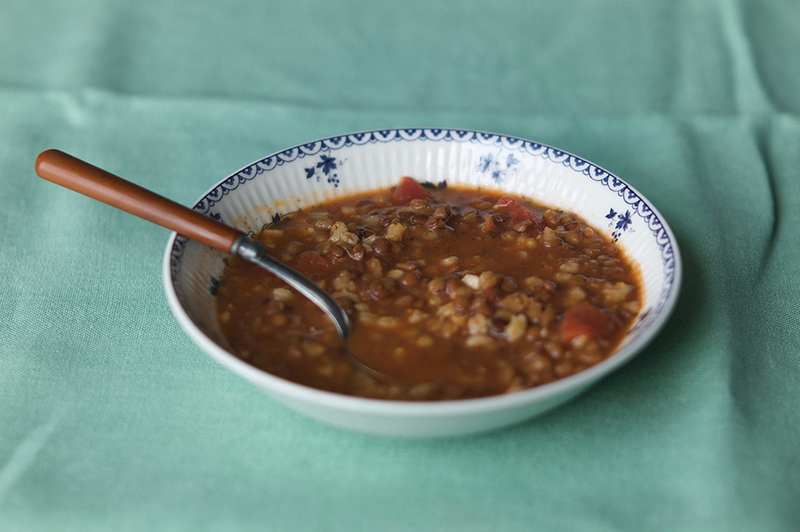 As soon as the soup has boiled, turn down to a simmer, and cook until the lentils and barley are tender, about twenty to thirty minutes. Top with butter, squeezed lemon, crumbled bacon, and a dash of Aleppo pepper to serve. 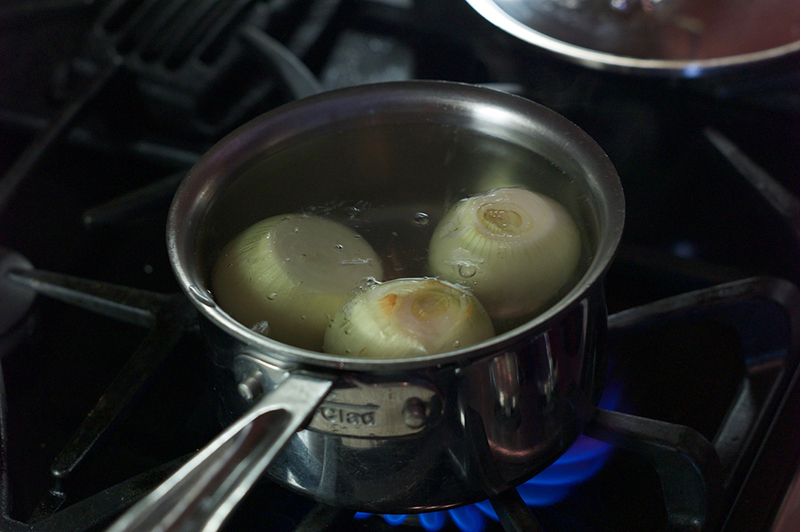 Put the onions in a small saucepan, submerge in cold water, cover, and bring to a boil. Cook with the lid ajar for thirty to forty minutes, until the onions are fork soft and starting to fall apart. Drain the onions, chop them roughly, and place in a medium serving bowl. Add milk, butter, and salt and pepper, to taste. Add the brewed tea and the sliced apples to a medium saucepan. Cover, and bring to a boil. Turn down to a simmer, and cook until the apples are soft, five to ten minutes. Drain. 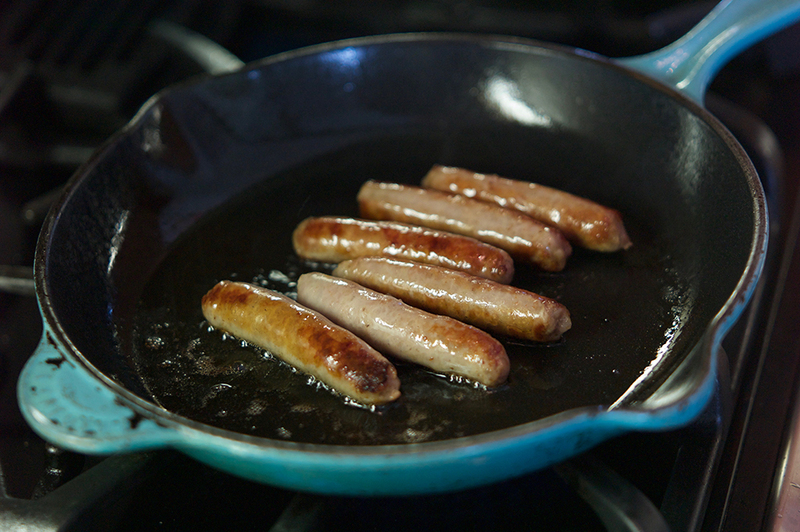 Fry the sausages in butter over medium heat until they begin to blacken on all sides. Place the apricots in a small, heatproof bowl. Cover with boiling water, and let stand for twenty-four hours. Combine flours and sugar in a large bowl. Whisk together. Add the stick of butter, and pinch and rub it in with your fingers until the mixture is clumpy and well combined. 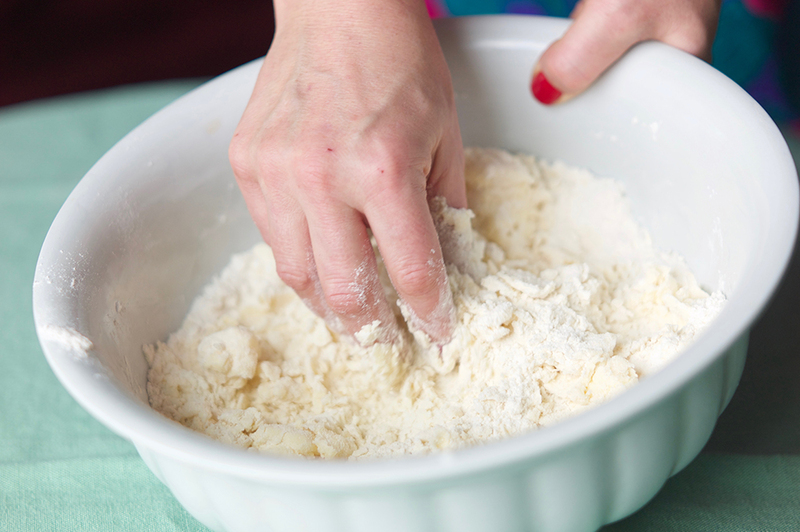 Press the mixture into the bottom of a nine-by-nine square baking pan or a nine-inch round one. Prick all over with a fork. Bake twenty-five to thirty-five minutes until golden on top and beginning to brown at the edges. Remove from the oven. Slice while still warm, but let cool before removing from the tray. Serve each piece of shortbread with a few apricots on the side. 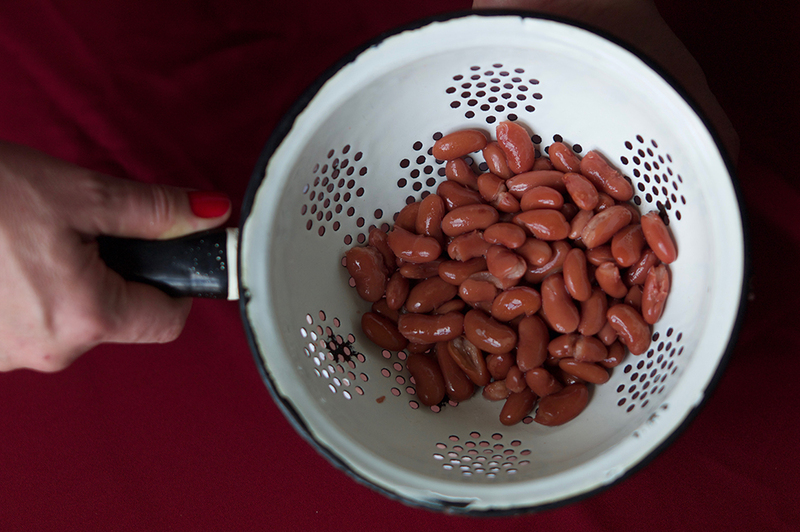 Drain the beans of their liquid, and rinse under cold running water. Combine with all other ingredients, toss, season with salt and pepper, and serve. Peel and slice the bananas, dividing the pieces between two small dessert bowls. Pour half the cream and one teaspoon of sugar over each bowl. Serve.